What Makes Us Better Than The Big Guys? Reviews of BEST WEBSITES! BEST PRICES! How Much Will It Cost To Build My Website? Now that you have your perfect domain name and your website is built, you need to find a server for hosting your website. A server is a big computer where your website will reside. The server computer runs all day and all night so that your website is available whenever someone wants to see it. Hosting companies have many computers, and each computer can hold hundreds of websites. This is called a "Shared Server". It is the least expensive type of hosting because you are sharing the server resources with others. 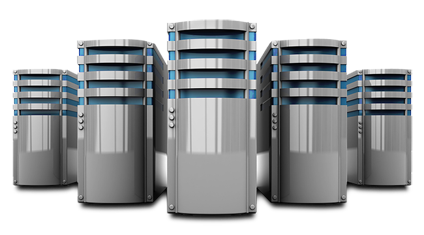 Larger websites will need more resources so the hosting company will require them to have a VPS (Virtual Private Server). This is because a busy website will tend to use the resources of the computer, leaving smaller websites without their fair share. This could mean that people who want to see your website might have to wait and wait for your pages to load. A Virtual Private Server has fewer websites and costs more than a shared server. If a website gets REALLY big then it needs a Dedicated Server so that it has ALL the resources available on that computer. Dedicated Servers are dedicated to one user. It is the most expensive type of hosting. BEST WEBSITES has a Dedicated Server with a very dependable company called OVH. For now, your website hosting will be "shared" on a BEST WEBSITES Server. Some hosts offer tech support. Some hosts do not and you will be required to pay extra if you need help. Obviously you will pay more for those who offer included support. BEST WEBSITES offers full support for anything you may wish to do on your website for as long as you are hosted with us, at no extra cost. Cost For Maintenance Of An Established Website? Copyright © 2019 Best Websites. All Rights Reserved.